The Brookfield WPCA vehicles have fleet monitoring for location and speed by Orion Fleet Intelligence. They monitor thousands of commercial fleets. Orion has recognized Brookfield for Excellence in performance for 2018. Safety is a high priority. Congratulations to the WPCA Field Staff ! EXCELLENCE in Fleet Safety Award for 2018! In recognition of your organization’s demonstrated ongoing commitment to fleet safety, you have been given this award to share with your colleagues, customers, consumers, passengers, drivers and the community that you so proudly serve! This award is part of Orion Fleet Intelligence’s Annual Fleet Safety Awards. 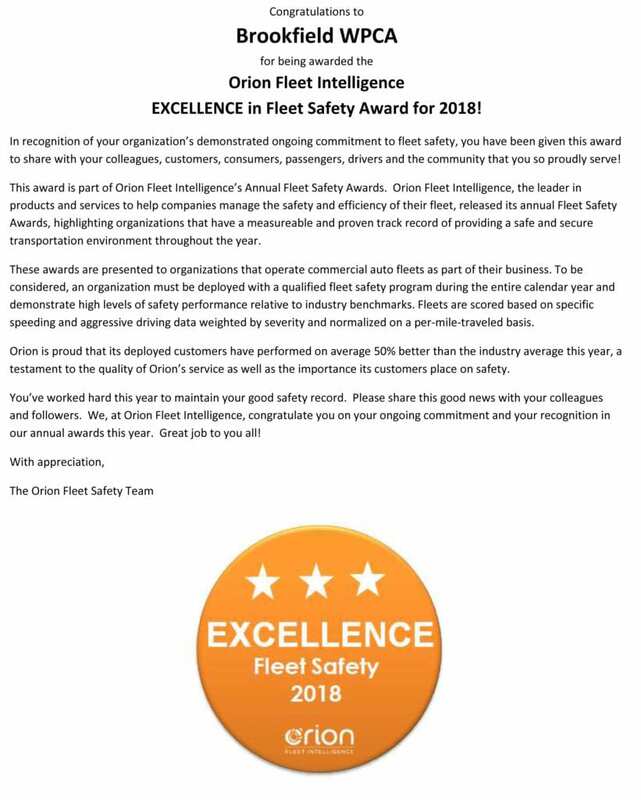 Orion Fleet Intelligence, the leader in products and services to help companies manage the safety and efficiency of their fleet, released its annual Fleet Safety Awards, highlighting organizations that have a measurable and proven track record of providing a safe and secure transportation environment throughout the year. These awards are presented to organizations that operate commercial auto fleets as part of their business. To be considered, an organization must be deployed with a qualified fleet safety program during the entire calendar year and demonstrate high levels of safety performance relative to industry benchmarks. Fleets are scored based on specific speeding and aggressive driving data weighted by severity and normalized on a per-mile-traveled basis.Orion is proud that its deployed customers have performed on average 50% better than the industry average this year, a testament to the quality of Orion’s service as well as the importance its customers place on safety.You’ve worked hard this year to maintain your good safety record. Please share this good news with your colleagues and followers. We, at Orion Fleet Intelligence, congratulate you on your ongoing commitment and your recognition in our annual awards this year. Great job to you all!